The results of the polls are shown on page 1 graphic. While street respondents were clear in their answer to the first question as to whether the FCID was doing a good job with 64 per cent saying “no (disagree)”, BT respondents were mixed with 43 per cent saying “yes (agree)”, 33 per cent saying “no” and 23 per cent, undecided (unable to comment). 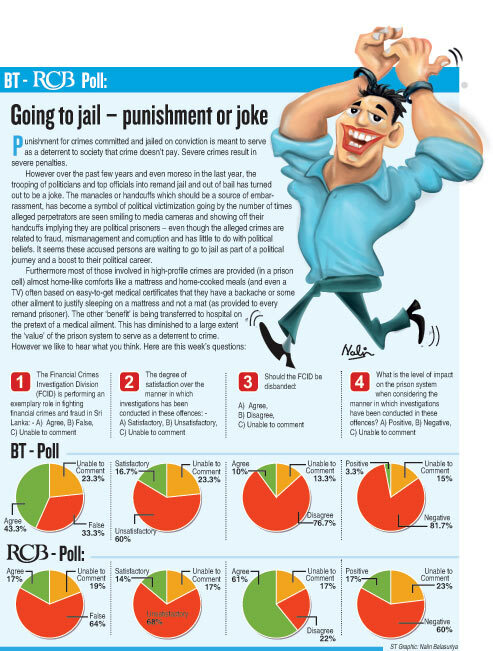 Both polls were critical over the manner of arrests (trooped into court, showing off handcuffs, drama enacted outside with statements to the media, special benefits in jail, etc), with 60 per cent of street respondents saying this had caused a ‘negative’ impact while 82 per cent of BT respondents also said ‘negative’. The rogues are not taken in for the real crimes they have committed. The FCID should not be dissolved. We need an institution like this to maintain discipline in a country. Their activities should be further expanded but made more efficient. Although things do not materialise now, it will improve in the future. Both sides are corrupt. The side in power has the edge of benefits. The real scene will happen when the other side comes to power. We will be the spectators. We have no confidence in this system since no one will get a proper punishment. We get fooled every time. This idea (FCID) is good since it can bring out a real change in the country. Now they will fear to rob in the future. This is a joke. It serves no purpose and we have no confidence in it. Those who are taken in will return as ministers one day. It is like a tele drama. The JVP is playing a part in this. Only allegations against the opposition are investigated. What about (former Central Bank Governor) Arjuna Mahendran who has allegedly robbed millions. Why hasn’t his statement been recorded by the FCID?